At Pro Print Solutions we supply and service a full range of mono/colour A4/A3 photocopiers /multifunctional printers and digital office solutions to local businesses and schools in Wigan and throughout the North West. Whether you are looking to buy or lease a photocopier, or take out one of our photocopier rentals plans short or long term, the latest range of Olivetti, Develop, Konica Minolta and Canon photocopiers range ensures that we can supply and support the perfect photocopier to suit your requirements. Based just outside Wigan in Blackburn, all service and maintenance is carried out by our own manufacturer trained and accredited photocopier engineers. Our dedicated service and support team are on hand to offer daily assistance to ensure your photocopier is reliable and operates efficiently. At Wigan Photocopiers looking after our customers is our number one priority. Having photocopier engineers based in Wigan and the local areas as well as the office allows us to provide the highest levels of support onsite and offsite and excel in our levels of service where others fail. Wigan Photocopiers supply and stock the majority of consumables for Canon, Olivetti, Konica Minolta, Ricoh and Develop, these include toner, drums, imaging units, transfer belts, rollers and all major components. For all latest pricing or if your require any assistance regarding consumables for your photocopier then please call 0800 970 2244. 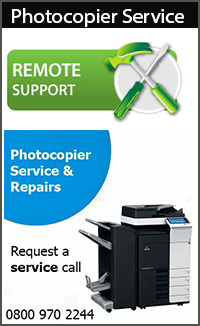 For more information regarding our photocopier support packages we provide in Wigan or if you would like to book a service call for your Photocopier then please contact our service team on 0800 970 2244 or complete the form below. Visit our dedicated online store www.proprintsolutions.co.uk to view our latest range of photocopiers printers and consumables.